Ideal for encoders, Control-Flex® Couplings were developed to satisfy today’s higher performance requirements and can be used for parallel, angular and axial shaft misalignments, all while maintaining constant transmission of torque and angular velocity. To meet this goal, Zero-Max engineered a unique Control-Flex® Disc which is based on a parallel linkage system. 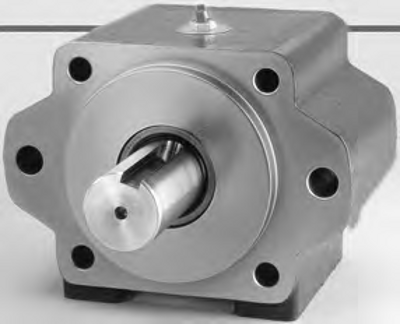 Because of this unique design, the reaction forces due to transmission of torque and unavoidable shaft misalignments are considerably smaller when compared with common flexible shaft couplings. They are available with clamp-style hubs or in a bolted-style, drop-out design for easy flexible disc changeout. Clamp-style couplings provide a positive, secure shaft connection. They have two hubs (that attach to the shafts) and a center flex member that is affixed to the hubs through pins. Our clamp-style couplings are available with a single flex disc for standard torque capacity, or with two flex discs for increased torque capacity, torsional stiffness, and length. Bolted-style couplings also consist of two hubs (that attach to the shafts) and a center flex member affixed to the hubs through shoulder bolts for drop-out capability. Our bolted-style hubs incorporate a keyway and setscrew shaft attachment. Available in 11 sizes in single and double disc models. Double disc models provide highest misalignment capability. Torque ratings range from 0.5 to 250Nm. Hubs and center members manufactured of aluminum alloy for strength and durability. Both are treated to prevent oxidation and to preserve appearance. Disc members are made of 304 stainless steel. Couplings are precisely assembled using high strength, corrosion resistant fasteners. 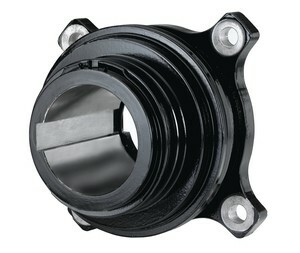 Integral clamp style hubs provide fast, easy mounting. RoHS compliant – manufactured of RoHS compliant materials and contain no banned substances. 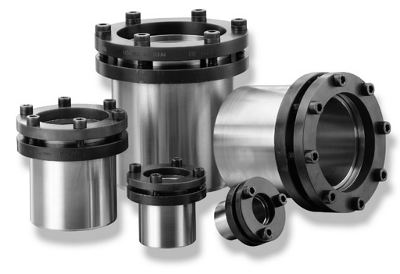 Zero-Max offers a variety of Schmidt coupling designs, including offset couplings, inline couplings, and 5-D couplings. 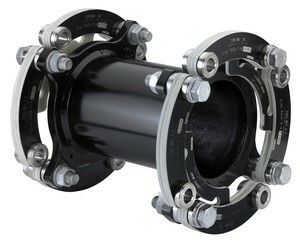 These couplings provide the utmost precision for parallel offset shafts. They transmit constant angular velocity and torque in a wide range of parallel shaft misalignments. Schmidt offset couplings impose no radial loads on shafts or bearings, and eliminate radial shaft vibrations. No performance is lost by increasing offset. Schmidt Inline Couplings are designed with high torsional stiffness. These linkage couplings accommodate small parallel shaft misalignments at constant angular velocity. 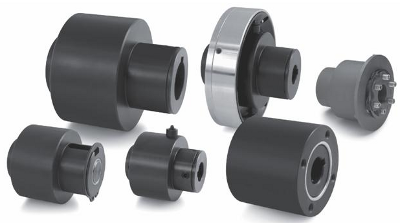 Designed as dropout couplings, they are easy to install and offer excellent drive performance for low to medium shaft speeds and in medium- to high-torque applications. These couplings provide parallel shaft misalignment and a ± 5° angular misalignment with moderate axial shaft displacement capabilities. These couplings maintain constant angular velocity at all misalignment modes. Featuring easy to maintain spherical roller bearings, Schmidt 5-D couplings are recommended for high torque, low RPM applications. 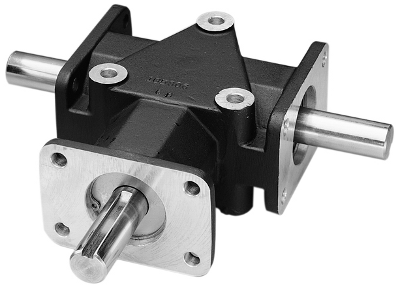 4-bolt mounting (non-SAE) accommodates same loads as the Model 200 with ball bearings for motor and pump shafts up to 1 inch in diameter. SAE “B” 2- or 4-bolt mount using tapered-roller bearings. Standard input bores include: 7/8″, 1″, or 1-1/4″ keyed; 13 tooth 16/32 spline, or 15 tooth 16/32 spline. Also available with 1″ keyed through-bore as a standard. SAE “C” 2- or 4-bolt mount using tapered-roller bearings. Standard input bores include: 7/8″,1″, or 1-1/4″ keyed; 14 tooth 12/24 spline. Also available with 1″ keyed through-bore as a standard. SAE “D” mount using large tapered-roller bearings for heavy-duty applications. Standard input bores include: 1-3/4″ keyed, or 13 tooth 8/16 spline. Both the SAE “E” and SAE “F” mounts have the same physical size; only the pilot diameter and bolt circle are different for motor or pump mounting. These models use large spherical-roller bearings for heavy-duty applications. Input bores are made to customer specifications up to a 2-1/2″ diameter. Simple to install. No special wiring or training. Use adjustable speed drives anywhere on machine. Accepts input to 2,000 RPM. Ideal secondary controller. Delivers constant torque throughout the speed range. 4:1 speed reduction. Drive is often usable without additional speed reduction. Permits slow or fast, small or large speed changes. Speed set-ups are made quickly and easily. Ideal for dancer applications / constant speed changes. Leave drive at one setting. No daily speed cycling. Accurate speed holding. No “wear-in” period / constant speed operation. Zero-Max adjustable speed drives accepts any input. It’s the world’s most versatile, economical secondary drive. Goes to zero output. Ideal for use as a clutch. Low cost and proven design. More than 1,000,000 sold. Ideal for users and original equipment manufacturers. Sealed housing. Use in most atmospheres. Can be mounted in any position. Versatile shaft / control / motor options. Infinitely adjustable. 0-400 RPM speed range with 1800 RPM input. 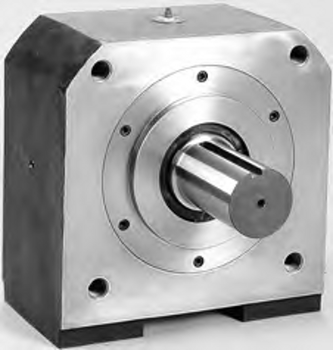 Crown Gear’s bevel gearboxes are designed for dependable, economical transfer of speed or power. 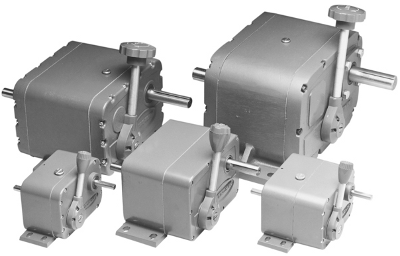 These premium 90° gear reducers are compact and feature efficient, quiet operating spiral bevel gears. 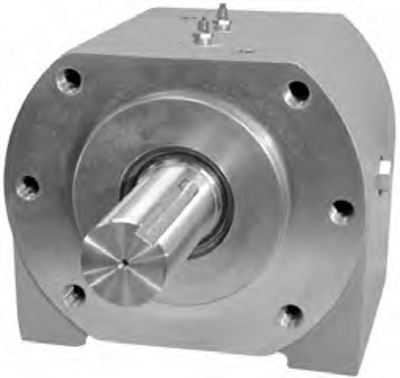 Crown Gear 90 degree speed reducers are available in 1:1 and 2:1 speed ratios with available two or three-way versions. A wide range of miter gearbox shaft styles are also available, as well as specially designed units to handle most applications. Determine your preferred input/output ratio – Standard ratios are 1:1 and 2:1. It is also possible to use a step-up ratio of 1:2 by using shaft #2 as the input shaft. Designate which shafts are to be the input and output shafts – This step is especially important in making sure that no shaft will turn faster than 2000 RPM. If shaft #2 in the 2:1 ratio models is selected as the input shaft, it can turn at a maximum of 1000 RPM. In the 1:1 ratio models it makes no difference. However, the choice in either case will affect your mounting. Designated output shaft – The designated output shaft must have a torque capacity greater than your application load. Choose drive type – Choose either a 2-way or 3-way configuration. Select the correct model number – Select the correct model number that corresponds with your chosen drive type. Modifications of shafts and housing – If modifications of the shafts and/or housings are required, then please send us a drawing and description of the application. 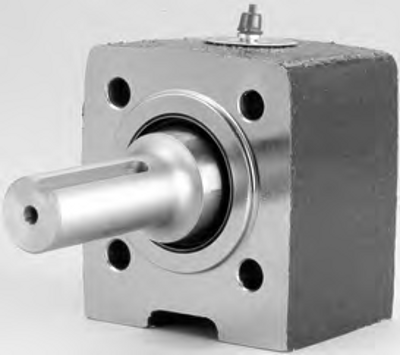 Keyless shaft bushings provide solid connections between the shaft and hub, without stress or wear to mounted components. Using hydraulic pressure to maintain their position, they eliminate keyways, tapers, and tapped holes, which can cause component stress and wear due to fretting, corrosion, and backlash. A keyless shaft bushing does not rely on the key to transmit torque, but instead utilizes the entire circumference of the shaft for more efficient performance with little to no backlash. Hydraulic pressure is distributed evenly over the full length of the connection, reducing micro-movement which can cause fretting. Keyless bushings make mounting components an easier, faster, and more precise process. All you need to do is mount, set in position, and lock the bushing with a torque wrench. Unlike bushings with keyways, a keyless locking bushing is infinitely phase-adjustable, both radially and axially. This makes them more precise and easier to use. They can be tightened and repositioned with minimal downtime and without causing additional wear on the shaft or components. And, because they eliminate the need for milled keyways in shafts, smaller shafts can be used to transmit the same amount of torque, thereby saving space and material. Zero-Max’s Torq-Tender overload safety devices incorporate torque limiters for dependable overload protection. When a jam-up or excessive loading occurs, the built-in torque limiter will reliably and quickly release to prevent system damage. The Torq-Tender torque limiter is tamper-proof. Once installed, the torque value cannot be changed. This feature ensures the integrity of the machined design, and renders costly and potentially risky calibration procedures unnecessary. Torque value is controlled by the part number that is ordered; that value determines what spring is used during assembly of the torque limiter. Torque values can be changed in the field, however; the torque limiter must be disassembled and the springs replaced to achieve the new torque value. Standard Torq-Tenders are bidirectional. Torque value remains the same regardless of rotation. If specified, the torque limiter can be configured at the factory to release at different torque ratings for different rotational directions. When used as a coupling, the Torq-Tender fulfills two functions: 1) A flexible shaft coupling; 2) a mechanical torque limiter. In the shaft-to-shaft configuration, the Torq-Tender can accommodate angular shaft misalignment up to 1.5° and parallel misalignments from 0.005” to 0.015”. The enclosed design of the mechanical torque limiter enables it to operate in a wide variety of industrial environments. Special designs and materials can be used to withstand even the most adverse conditions. Every Zero-Max torque limiter is made from durable heat treated steel for a long operational life. Zero-Max’s Roh’Lix® linear actuators are threadless, mechanical, screw-type devices designed to convert rotary motion into precise linear motion and thrust using rolling element ball bearings. These adjustable automatic overload protectors will slip when overloaded, providing linear clutching without any additional clutch mechanisms. The Roh’Lix® is intended for horizontal or vertical axial loading applications. Axial loading allows for even load distribution across all six of the device’s bearings. Sideloads and twisting loads should be avoided whenever possible, as they cause uneven bearing loading and can shorten lifetime. Whenever possible, the load weight on the Roh’Lix® linear actuator should be supported by a separate linear bearing assembly. The Roh’Lix® is available in five inch and five metric sizes, offering between 15 and 200 lbs. thrust capacity. It can be used in horizontal or vertical applications. All bearings are lubricated for life and require no additional lubrication. Hardened-and-ground shafting with a minimum hardness of 58 HRC is recommended; stainless steel shafting and hollow shafting can also be used for specific applications. Advanced and patented all-in-one technological solution for wind turbine drivetrains with capacities up to 5MW. Protects wind turbines against peak loads, reverse torques and grid shorts. Established designs for slip torque values ranging from 4,000 to 50,000Nm.